Hello, my name is Daniel Simpson and I am the guest blogger this week while Roy is away. 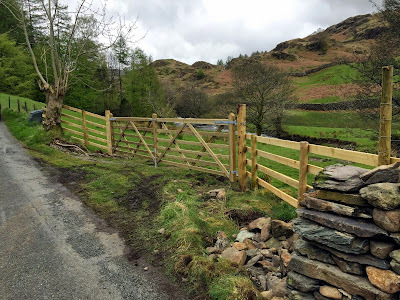 I am a member of the Ranger Operations team based in the North Lakes covering an area from Borrowdale round to Ennerdale. 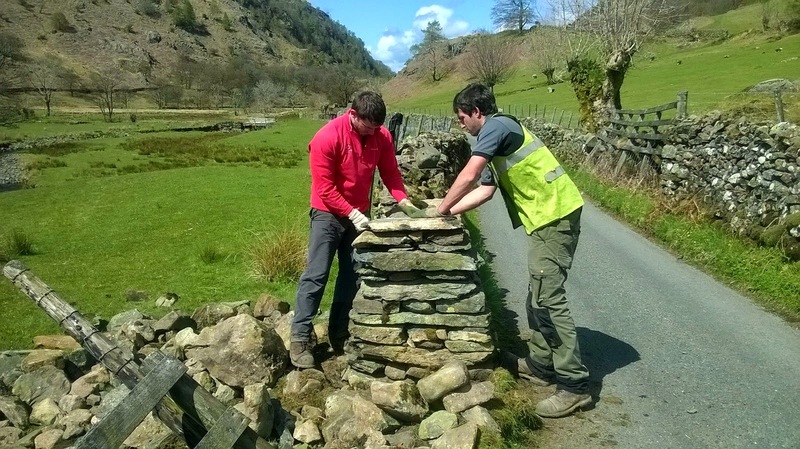 A major part of our work includes the practical jobs such as: dry stone walling, fencing and hedgelaying. We also spend time working at events such as the recent Keswick Mountain Festival, plus anything else which is asked of us from the other departments. On Tuesday myself and Jack from the Operations team spent the day working in Ennerdale. Jack and I work with the Wild Ennerdale volunteers several times during the year helping them with a variety of tasks. Tuesday saw a great team effort with staff and volunteers from Wild Ennerdale, the National Park, Forestry Commission and the John Muir Trust all working together. But before the work began we met at the Ennerdale Scout Camp where Rachael Oakley the Wild Ennerdale Project Officer fuelled us with tea and cake. The large group of staff and volunteers were split into three work forces. Jack and I joined the team who were cutting down small spruce trees. Jack cutting down a spruce tree. Line of cut spruce trees. These trees would then be attached to large larch poles that will create an embankment on the edge of the River Ehen therefore reducing the amount of sediment that is washed into the river. If sediment continues to be washed into the river the young freshwater pearl mussels will be smothered and will not be able to receive the oxygen they require to survive. This job is just one way in which the severely endangered freshwater pearl mussels are trying to be saved by the Pearls in Peril Project.At the same time as we were cutting down the trees; the rest of the work party were removing a redundant fence as well as planting up a new woodland. 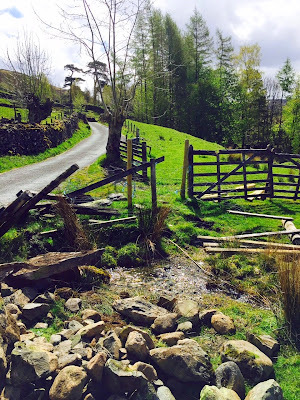 The following day I led a group of primary school children who had been staying at the Borrowdale YHA on a farm walk around Seatoller Farm. Whilst they are at the farm the children will hopefully gain knowledge of where their food comes from and how farming has helped shape the landscape. They seemed to be fascinated by the way Shepherds used to count their sheep using the traditional method of “yan, tan, tethera…” and the hefting system that exists in the Lake District fells which means the sheep know where to go when they are up in the fells. The hefting system is the way that a female sheep takes its lamb to the same area of fell that it was taken as a lamb for the first time. Children get the chance to touch a herdwick lamb. The hefting system is explained to the children. The next couple of days will be taken up with ensuring the car parks are presented to a good standard in time for the busy summer season by strimming the grass. 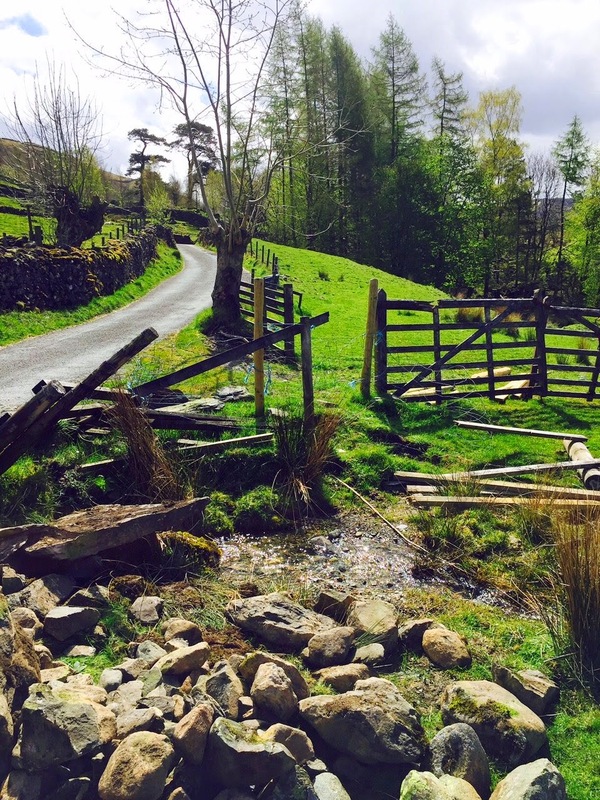 As well as carrying out some drystone walling on theDunthwaite part of the property. All in all this blog summarises how mixed a week for the Ranger Operations team can be. Jessie's post (The Keswick Mountain Festival). My name is Jessie Binns and I am doing the guest post this week. I’ve worked in the Lakes for 6 years now with the National Trust, and one of the highlights of my year each year is the Keswick Mountain Festival. This year the National Trust was nominated as the official supported charity for the festival for the second year running. They have thousands of people entering the running, cycling and swimming races (which mostly take place on fells and in lakes that we care for around Keswick). What we help them with is making sure that the families who come onto the ‘Festival Village’ on our Crow Park at Keswick also have a really good time. When I was talking with the Lakes rangers about what we should do on the National Trust stand this year, they started talking about a really inspirational film they’d seen at our ‘Outdoor Conference’ last October. Project Wild Thing is a funny, and moving documentary about one father’s quest to find out why his children prefer watching TV to playing outdoors. The National Trust helped to fund the film and so the rangers wanted to use our stand at Keswick Mountain Festival to launch a ‘Wild Summer in the Lakes’ to give families lots of ideas of places to go and things to do to make it easier to make the outdoors fun. So, on the stand we had den building, mud pie making and ‘extreme’ tree climbing to 35ft (thanks to the Lake District forestry team for this). Inside the yurt we had some amazing wild art activities run by the staff from Wordsworth House and Garden, who reminded us that of course William Wordsworth grew up roaming the riversides and fells of the Lake District and could be described as the original wild child! Working at the festival is both exhilarating and exhausting. I’d put our people counters on the main gate and they tell us that 16,898 people came onto the Festival Village at Crow Park over the weekend – and that’s just during the day, let alone the music concerts. The ranger team worked in shifts from 8am to 6pm with some covering the evening until 11pm – it’s a lot of work! I think my highlight was, after enjoying watching Seth Lakeman playing on the main stage on the Saturday night as the sun set behind the fells, seeing him bring his children into the National Trust yurt to do some wild art on the Sunday morning, it’s great that every family, no matter where they’re from, can connect with us and find something that appeals to them. The festival’s over for another year, the bunting has been washed, dried and put away and it’s time for some very tired rangers to have a well-earned rest. I’m Jack one of the National Trust Estate Rangers who works with Roy. 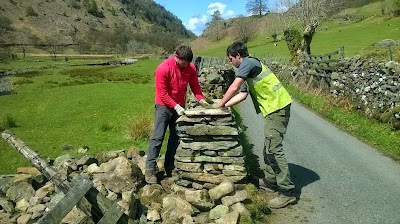 I’ve been working for the National Trust down Borrowdale for five years now. I love the job because I love working outdoors and the job is varied. 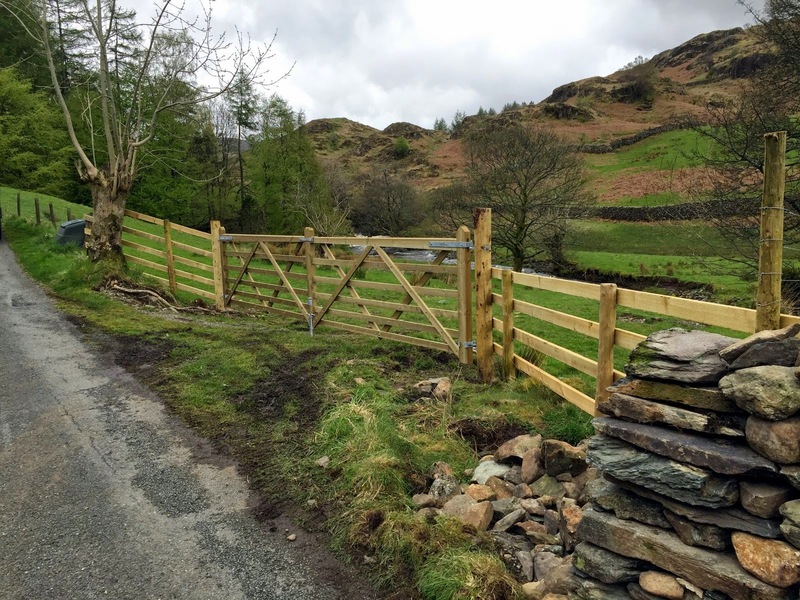 Last week the Ranger ops team carried out a project up at Watendlath. 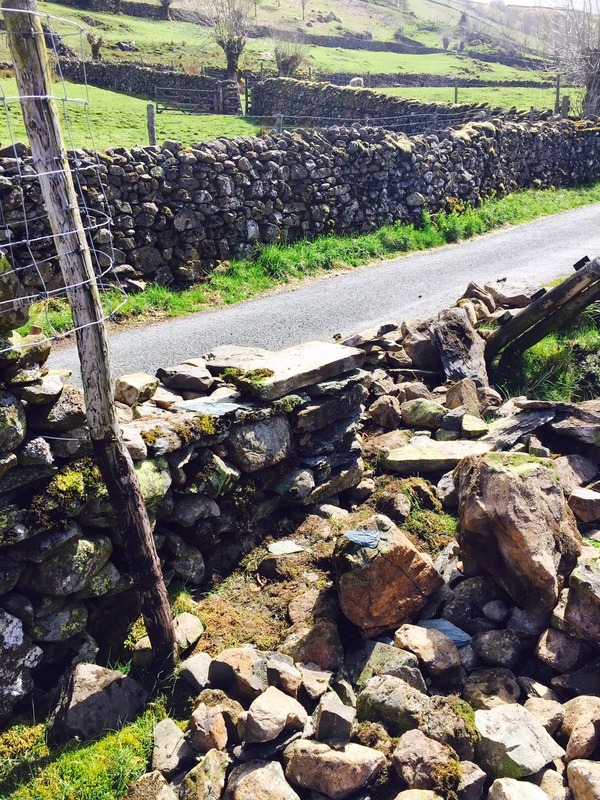 The project involved taking down a small section of wall and then rebuilding a quoin end. 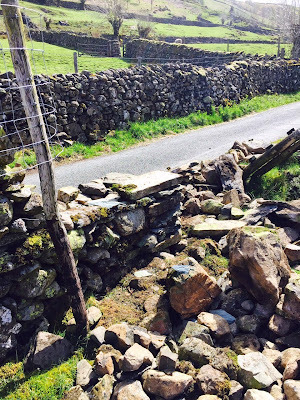 The stone left over from taking the wall down was used to extend a drain by building a stone culvert. 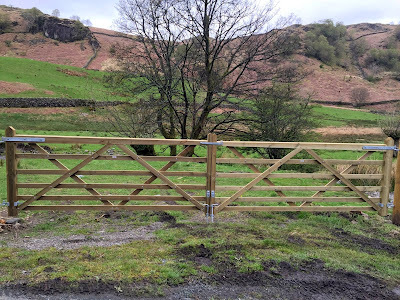 The project also involved replacing two eight foot gates with two ten foot gates. Either side of the gates was then railed up to make it stock proof. Luckily the weather was on our side with the sun shining and blue skies. 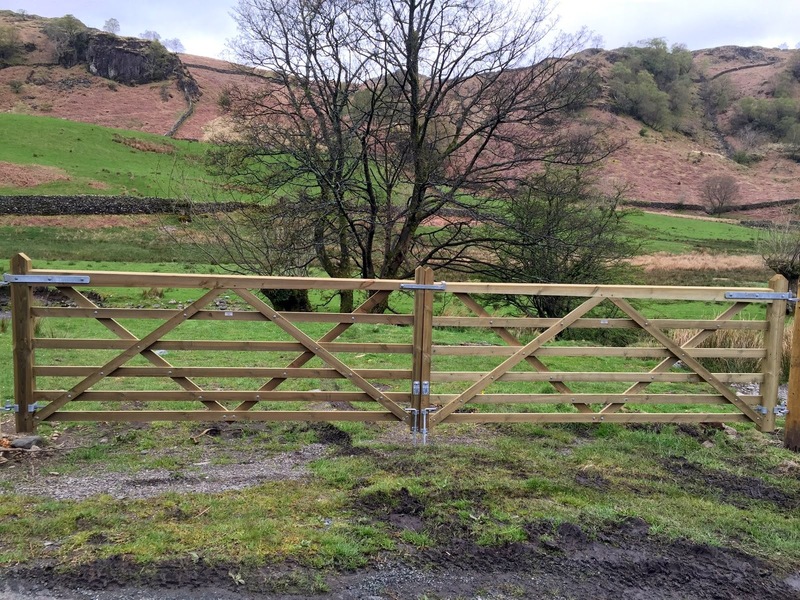 The reason for this project to be carried out was to make the gate way bigger for easier access. Also to make the field more stock proof for one of our farm tenants. I’m Leila, one of the rangers who work in the North Lakes with Roy. I’m an Academy Ranger, which means I’m one of ten trainees taken on by the Trust every year to learn everything there is to know about rangering and I was lucky enough to get placed here. The path is downslope from the road and every time it rains water runs down onto it forcing people off the path to get round, the answer was to put in a side drain and culvert and resurface the path. This requires a lot of gravel and the day before the volunteers arrived was spent carting materials to site. The Volunteers arrived on Saturday morning braced for rain but keen to get started. At the other end a pipe culvert needed to go in to channel water out of the drain and away from the path. Once the ditch was dug out we needed to fill it with gravel. Such a long drain required a lot of toing and froing with wheelbarrows. The pile of gravel soon went down and after the arrival of the second trailer load the ditch was filled. On the second day the path was finished off with lots more wheelbarrowing of gravel to cover the surface of the path. The before and after pictures - a vast improvement! We are very grateful to all the volunteers for their help, in fact they worked so hard they finished early and took to the nearby path from Kettlewell Car Park with loppers to clear back vegetation! So once again huge thanks are due to our Yorkshire volunteers who did another fantastic job for us. Looking at fresh snow on the fell tops now and it’s hard to believe that we had such warm, sunny weather last time I posted – our new ice-cream cart even made its debut. Spring has definitely arrived though and the signs are there for all to enjoy. Trees are in bud, lambs are gambolling in the fields and wild flowers are adding their flashes of colour to the landscape. Dandelions are especially bold with their displays but they close up if showers are threatening. They remind me of some of the stories we attach to plants, often with good reason but sometimes just echoes of long- forgotten origins. You can easily find the following on a short walk through Cockshott Wood and along the lake shore. Primroses – their name derives from the Latin prima rosa (first flower/rose). In folklore these are said to help you to contact the fairy world! 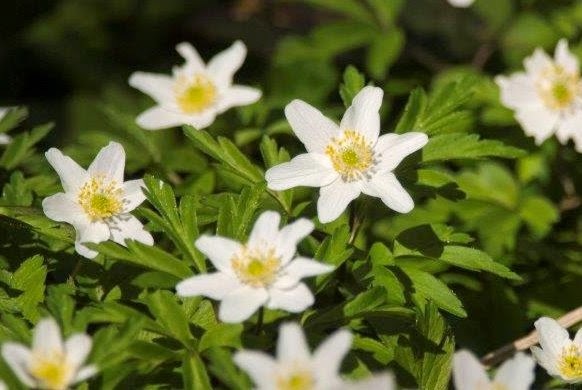 Wood anemone (wind flower) - the Greeks believed the flower was a gift from the wind god Anemos (or Eurus), sent to herald his coming in spring. Vinca (periwinkles) – these are associated with creating harmony in life. Hawthorn – the most famous of these is the Thorn of Glastonbury which flowers in May and also in December. Ours are at their best in Spring when they fill the air with their scent. Those are just a few examples but stories from your area could be quite different. You might find some surprises if you take some photographs on your next walk and follow up with a search on-line for more information. 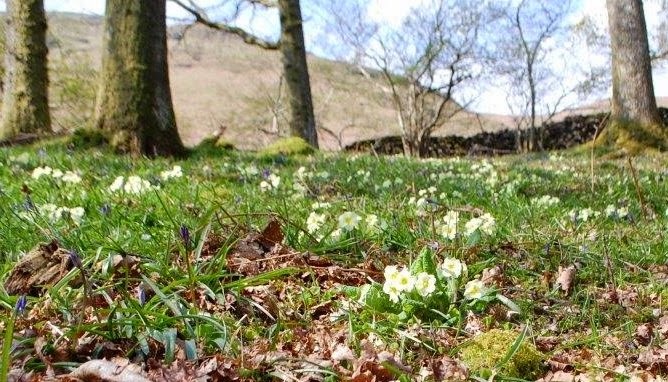 You could also visit our website at www.ntlakesoutdoors.org.uk if you’d like to find more about Spring wildlife experiences. P.S. 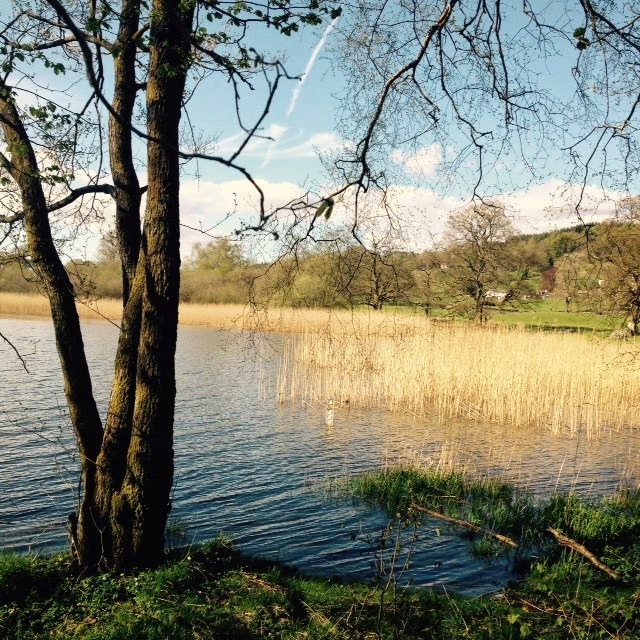 The first swallows have been seen and the first cuckoo heard in Borrowdale.